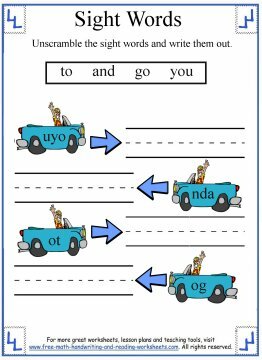 In this second section of sight words for Kindergarten students, we will be covering the words a, and, go, to, and you. For previous units, see the related lessons at the bottom of this page. 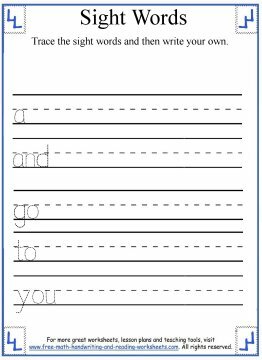 In the first worksheet, students will need to trace the sight words on the dotted lines and then practice writing each word with the remaining space. On the second sheet there are honeycombs with words on them. 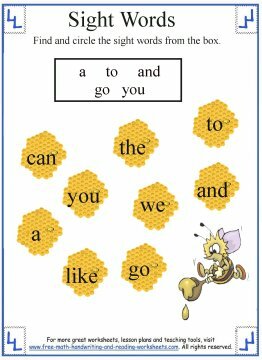 Have your child circle the honeycombs that have the sight words on them. The words are in a word bank at the top of the paper. The next activity is a word jumble. Have your students unscramble the words found on each car and rewrite them on the line. 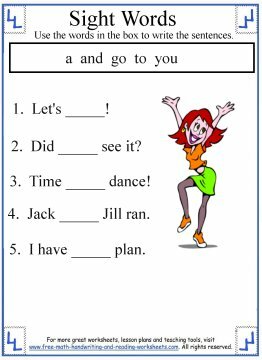 The last handout is a fill-in-the-blank activity. Using the word bank at the top of the sheet, have your students write in the correct sight word to complete each sentence.